This is by far one of the best books I’ve read all year. It’s a story about friendship and family and all the things people don’t say. It’s about silence, and the consequences of that silence, and it’s told in lovely, heartfelt prose. Saenz’s gift is subtlety — beneath a story ostensibly about a friendship between two Mexican American boys is so, so much more. The prose invites the reader to reach deeper, to attempt to grasp what lies between the lines, and yet the story works because there is so much more than what is within our grasp. Like Aristotle and Dante, we sense the depth of secrets the universe has to offer, and as they eventually realize, we find the answers much closer than we might expect. One late afternoon, Dante came over to my house and introduced himself to my parents. Who did stuff like that? “I’m Dante Quintana,” he said. Ari is a bit of a misfit. He has no friends, literally, and always feels out of place when talking to boys his age. His older brother is in jail, for a crime Ari has never been told; his parents never want to speak of the brother, and his father, a stoic, distant man, is struggling with PTSD from the Vietnam War. So when Ari meets Dante, a friendly, open book of a boy who is casually affectionate with his parents, it almost makes no sense for them to get along, and yet they click immediately. In both family and friendship, while the connections that form may be easy, the relationships are never quite that simple. The contrast between the boys’ families is sharp, and Ari understandably finds it difficult to trust that Dante’s family’s warmth toward him is genuine. Then an accident alters Ari and Dante’s friendship, and forces both to face things they may have been much more comfortable keeping hidden. And yet there are consequences to keeping silent, and the characters understand that all too well. The refusal of Ari’s parents to talk about his brother causes Ari to have nightmares, all these memories struggling to surface and yet being held back. Similarly, when Dante gives Ari his sketchbook, which he has never shown anyone else, and Ari refuses to look at it, it’s because of what Ari fears — and knows — he’ll find inside. Each time, not talking about something is the easy choice, and each time, it also turns out to be the more problematic one. 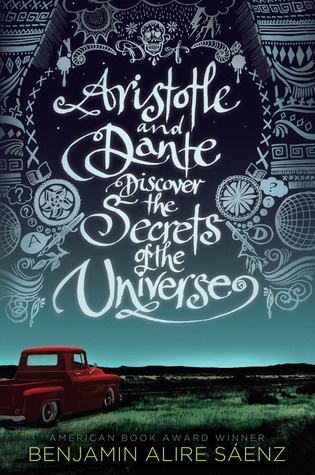 I discovered Aristotle and Dante Discover the Secrets of the Universe at Glad Day Bookshop. I asked the bookseller for the best novel he’d read recently. Without hesitation, he handed me this book. Turns out I’d bought the last copy he had in stock, and I discovered on Twitter the next day that there was someone after me who also wanted to buy it. I read it, absolutely loved it, and recommended it to my sister. Upon reading it, she marked it as a favourite in Goodreads and did a Google search for other books by this author. That’s just the kind of book this is. So read it. I hope you like it, and if you do, pass it on. This entry was posted in Book Reviews and tagged 50BookPledge2013, Simon and Schuster, YA by Jaclyn. Bookmark the permalink. I saw this book at my favorite book store a while ago. The cover had 3 medals on the front cover. That and the title intrigued me, but I hesitated buying it. I’m picky with the books I read. Your review helped me make up my mind: I’ll buy this book tomorrow.